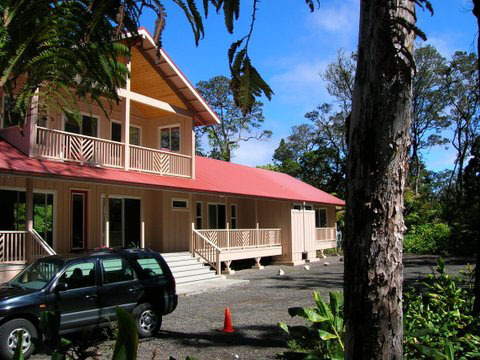 Come experience the restorative nature of the rain forest at Volcano Forest Inn, situated on 5 lush tropical acres in the heart of Volcano Village near Hawaii Volcanoes National Park. 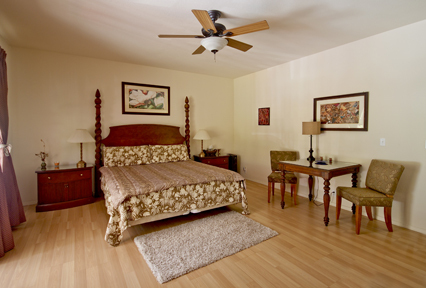 At Volcano Forest Inn our guests enjoy four spacious rooms with full walk-in closets, thick curtains, hardwood floors and private bathrooms equipped with clean, soft rainwater. 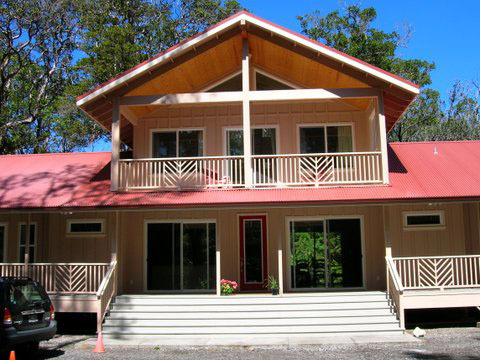 Each room has a private deck where guests can enjoy peaceful rainforest views. Whether you are looking for adventure or a peaceful getaway, Volcano Inn is the perfect home base to explore Volcanoes National Park, lava flow tubes, golf, Farmer's Market on Sundays, black sand beaches, waterfalls, and all that Volcano Village has to offer. Volcano Forest Inn has received the 2013 & 2014 Certificate of Excellence award from Trip Advisor the world's the world's largest travel site! The award celebrates hospitality excellence and is given only to establishments that consistently achieve outstanding traveler reviews on TripAdvisor. Winners of the Certificate of Excellence are located all over the world and represent the upper echelon of businesses listed on the website, with only the top 10 percent receiving the prestigious award. Our guests applaud our service, location and beautiful surroundings as the best Inn in Volcano Village. We take pride in our reviews and our guest loyalty. Our guests return and visit us every year. Rental Policy Update 8/2018 - Children age 6 and above ok.
Everybody who comes to Hawaii spends a day or two visiting the world’s most active volcanoes, Mauna Loa and Mauna Kea on the Big Island. Our volcano inn Hawai’i is located on the Big Island of Hawaii. We invite you to visit our forest inn and see Kilauea volcano the youngest and most active Hawaiian shield volcano, located on the southern part known as Big Island Hawai’i. Kilauea is truly one of the earth’s greatest wonders and mysteries. 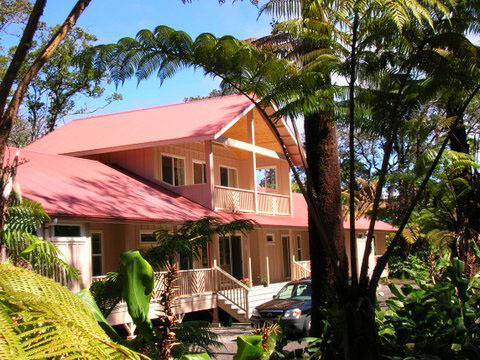 Volcano Inn Hawaii is situated on 5 lush tropical acres in the heart of Volcano Village, nearby Hawaii Volcanoes National Park. 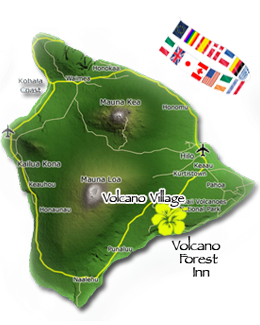 Walking distance to all Volcano Village has to offer: dining, village stores, cafes and travel information. Directions: From Hilo: turn right after miler marker 26 on Wright Rd. Turn left on Old Volcano Rd, drive past the stores and restaurants, first driveway on the right past the Post Office. From Kona: One mile past the entrance to Volcano National Park, turn left on Old Volcano Rd, past the Volcano Art Center it’s the third driveway on the left. are perfect for families and groups.